Sunset in the front yard of my small house. Better a dry crust with Peace and quiet, than a house full of feasting, with strife. I grew up in a 2,700 square foot home. It had 4 bedrooms, 2.5 baths, living room, dining room, family room, 2 and half car garage filled with new cars, all new furniture, and a cable TV in every room. The pantries were filled with name brand foods, and walk-in closets of always new clothes. It was a house of "feasting". But that house of feasting also came with a much strife; filled with arguments over money, expensive addictions, loudness of yelling, discontent, and abuse. Feasts are not inherently wrong, but there was no gratitude for the feast, only a want for more, newer, better. The effort was put into maintaining the "feast", not in seeking healthy relationships. The good thing about the TV in every room was we were able avoid each other in our havens. My current home is 910 square feet. It has 2 bedrooms and 1 bath, and a garage too small to park either of our cars. Our table in the eat-in kitchen and living room couch are just big enough to fit my husband and I with our two school aged sons, as long as we don't mind knocking our elbows every once in a while. We all learn patience as we share a bathroom. We learn closeness as we cuddle together for family movie night in front of the 15 year old TV. We are not exactly quiet, but it is the good loud of shared laughter. I smile as I hear the boys playing together in their shared bedroom that is connected to the living room. It is not perfect, we get each other's nerves like any family, but we seek to always love each other the best we can. There is a peace in the gratitude. To the world's standard of luxury, we may a "dry crust", but we have more than enough. 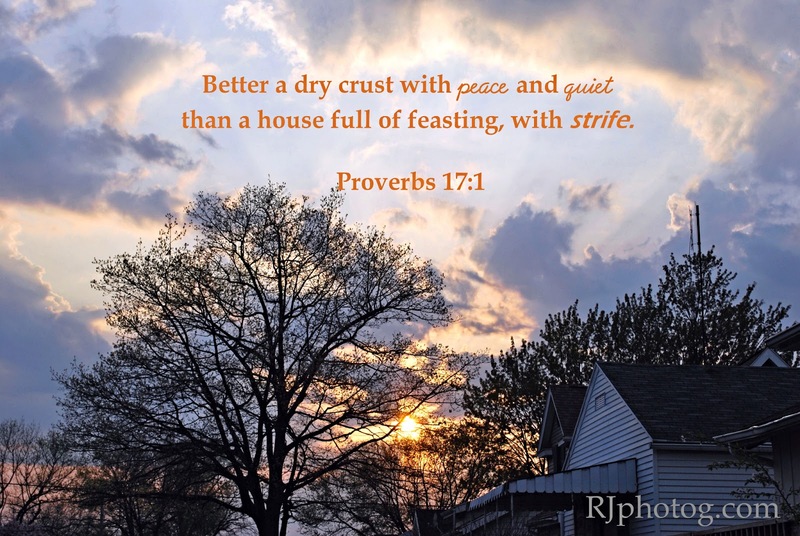 I would not trade my peaceful "dry crust" for the strife-filled"feasting" I grew up in anything for in this world. Just came across your website after doing a search for "freezer meals". I enjoyed reading your perspective on living life in small quarters. Our family of 8 enjoys the closeness of living in an 1100 square foot home, and will continue to do so until God provides a larger dwelling place.